As well as the songs listed below, you may wish to sing a more "general" Advent type song. Here is a list of general Advent suggestions. Sing out! God's going to fix the world's problems. Online resource Sing Zion's daughter! (Taylor Burton-Edwards) A modern paraphrase of the reading set to the familiar tune MORNING SONG. Would be very straightforward - but there are lots of verses! Free sheet music. Online resource / Tune In: We will sing a new song to the world (Dave Brown) An energetic song about the gospel. Free downloadable songbook, sound samples. MV180 Sing, Sing Out! (Sing a new song) (Jim Hannah) An excellent two-part round. 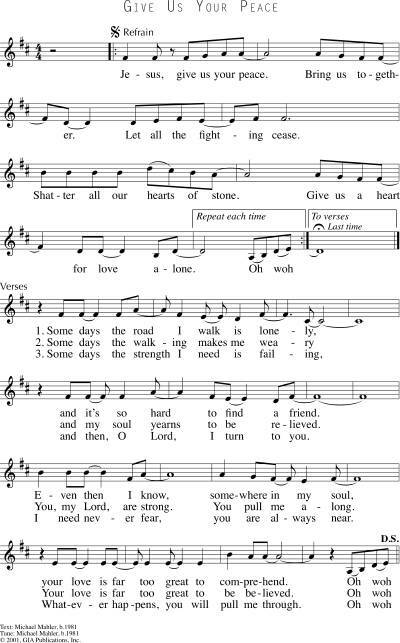 It’s worth teaching it to your congregation so they can sing it with confidence and break into two parts. Alternately, you could have a small group sing it in canon with the rest of the congregation. AoV1-071 / GA530 / GC(II)742 / G(3)837 / Lau462 Gather Your People (Bob Hurd) Excellent! Eucharistic theology. Sound sample and lyrics. *Online Resource Sing with joy you Advent people! (David Wood) A lovely set of words for this Sunday, set to the tune for "Angels we have heard on high". This may satisfy people in your congregation who just can't wait until Christmas to sing a carol. Lyrics and PDF. VU004 / G(II)255 / GC331 / GC(II)349 / G(3)412 God of All People / God of All Places (David Haas) Good words of worship and hope. "Breath of a new wind, fire in our hearts". Lyrics. GtG376 / Cha703 / URW133 When All is Ended (Brian Wren) Good words about the celebration of the new kingdom (wars ended, peace declared, compassion shown). Sung to the familiar tune SINE NOMINE or ENGELBERG. Lyrics & sheet music. New words to old tunes. More singing praises to God. Trust. See suggestions for Zephaniah reading above. NCH107 / LBW633 / ELW242 / GtG107 / GC346 / GC(II)351 / G(3)423 / W&R160 / Cha138 / Lau157 Awake Awake and greet the new morn (Marty Haugen) Joyful song! Sheet music samples. Taizé / AoV2-109 / CH772 / GA429 / GtG654 / A&M334 / SFFS 2195 / G(II)396 / GC566 / GC(II)546 / G(3)639 / SP128 / URW381 / Lau944 / W&R448 In the Lord I'll Be Ever Thankful / El Senyor (Jacques Berthier) A joyful and bouncy Taize song. Works well in English, German and Spanish at least. Good for kids. Sheet music, translations into many other languages, sound samples. G(II)129 / GC148 / GC(II)81 / Lau399 Cry out with joy and gladness / With Joy you shall draw water (Marty Haugen) A nice arrangement of this reading. The tune is really similar to "Let us build a house", so maybe it would be confusing? It's very straightforward to sing. Lyrics, sheet music sample, sound sample. 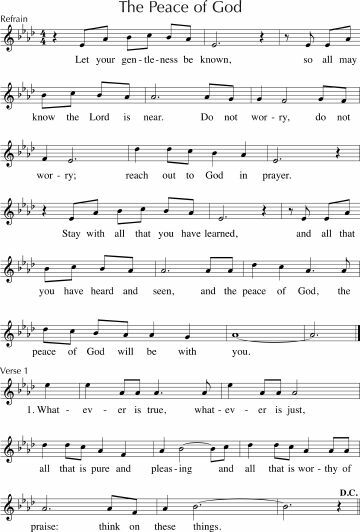 *MV222 May the peace of God be your peace (Neil McLaren) A lovely benediction. Will need to be taught first. AoV1-072 / GA341 / A&M191 / SP74 / Lau692 We Shall Draw Water (Paul Inwood) Cantor and congregational refrain. Quite nice. ATW 435 Like the woman of old / Wellsprings (Don Stewart) A favourite song in our congregation about going to the "Wellsprings of life"and finding Jesus there. Picks up themes of tiredness, broken hearts and weariness, but makes the point that it's worth the effort. It's not specifically related to this reading, but would probably work quite well. Rejoice, be gentle, God's near, don't worry, bring your worries to God and peace will come. *UMH729 / VU682 / LBW161 / WoV762 / ELW627 / GtG373 / PH450 / CP573 / W&R539 / Cha711 / URW140 / 82Hml-597 O day of peace that dimly shines (Carl Daw) A song of hoped-for peace. The tune in Chalice hymnal is really nice (CANDLER) or O WALY WALY which is used in URW. Other sources use JERUSALEM, which is a bit too militaristic for me. Lyrics and JERUSALEM sheet music. New words to old tunes. STB289 / Sing with the World Now I know by God's own grace / Ey lou nis (Cambodia) A call and response benediction. Would be simple to sing, in English, and if you have members who speak Khmer, could be good to learn! “Now I know by God’s own grace all of you are the children of God. So with hope go out in peace, bring good news to all people on earth." A sample in Khmer here. Unknown source Alleluia, the great storm is over (Bob Franke) lift up your wings and fly! I especially love the image of the infant sleeping while the mother sang until the bridegroom returned. The chorus is really catchy and very easy to sing. If not familiar, you can use a cantor or soloist for the verses and invite the congregation to join in the chorus. We tend to sing this more like a gospel anthem. Lyrics. Video with poor image but good sound. Taizé / TiS 739 / AoV2-041 / ATOK 404 / VU290 / GA269 / SFFS 2054 / GtG820 / G(II)451 / GC639 / GC(II)626 / G(3)733 / CP568 / W&R421 / URW388 / Lau947 / LUYH444/ VF088 Nothing Can Trouble / Nada te turbe (Theresa of Avila / Taizé) Excellent and quite well known Taizé chant. Spanish lyrics are not too hard for non-Spanish speakers. Sheet music, sound samples, lyrics and translations. Good for kids. Recorded music If this thing should spill (Born in the Flood) A plea for peace to dwell in us and overflow. Sounds kind of like U2. Lyrics. Slideshow (with sound sample and lyrics). GC(II)722 / G(3)826 Jesus give us your peace (Michael Mahler) Gospel song. It kind of merges personal peace with global peace. "Jesus bring us your peace, bring us together, let all the fighting cease…" Good for kids and teenagers. Lyrics and sheet music. Sound sample. *Taizé / AoV2-109 / CH772 / GA429 / GtG654 / A&M334 / SFFS 2195 / G(II)396 / GC566 / GC(II)546 / G(3)639 / SP128 / URW381 / Lau944 / W&R448 / StF776 / MP865 In the Lord I'll Be Ever Thankful / El Senyor (Jacques Berthier) A joyful and bouncy short song. Works well in English, German and Spanish at least. Good for kids. Sheet music, translations into many other languages, sound samples. AoVK-75 / VU249 / SLW010 / HPP397 / W&R650 / MP577 Rejoice in the Lord Always and again I say rejoice (Unknown) This is a fun Sunday School-type song, that also works as a round. I used to love this, and I'll admit that I still think it's fun; we used to stand up and sit down a lot in this for fun. Note that the tune varies between sources. Good for kids. Oldy-but-a-goody. GC(II)719 / G(3)823 Let your gentleness be known / The Peace of God (David Haas) A quite lovely song that picks up the images of purity without being overly pious. “Let your gentleness be known so that all may know the Lord is near. Do not worry, do not worry. 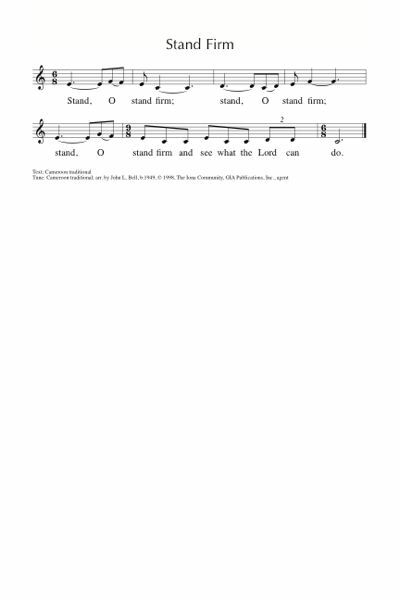 Reach out to God in prayer” Sample sheet music. Sound sample. It’s much better than it sounds in the sample. AoV1-106 / UMH376 / WoV774 / ELW753 / GtG752 / G(II)528 / GC730 / GC(II)724 / G(3)822 / CP562 / Cha297 / URW443 / 82Hml-712 / Lau904 Dona Nobis Pacem (American folk song) This is very well known, and would fit well with this reading. Good for kids. Oldy-but-a-goody. Taizé / TiS 713 / Cha296 Dona nobis pacem domine / cordium (Jacques Berthier) A more solemn chant. Youtube. *Taizé / CH276 / VU22 / GtG090 / ELW262 / GA283 / A&M053 / G(II)256 / GC332 / GC(II)340 / G(3)406 / CP094 / W&R166 / PfAS037B / SP28 / URW396 / Lau088 Wait for the Lord (Jacques Berthier) Wait for the Lord whose day is near, wait for the Lord, keep watch, take heart. A lovely simple Taize chant; some sources have cantor lines, and some older sources are not inclusive. Sheet music, translations and sound samples. John preaches it! Reprimands everyone and then tells them how they should live right. AoVK-50 / ATW 430 Come let us praise our God / A voice is heard (Trisha Watts) Excellent and energetic. Good for kids. *Online Resource In these times (Marty Haugen) This is not specifically an Advent song, but when I hear John saying telling his listeners that their ancestry does not give them special rights, I think about those people in my country who do not want to welcome the poor and the stranger. This is a song I think John might be singing in Australia, and probably elsewhere in the world, today. Sound sample & info. *TiS 263 / CH607 The bright wind is blowing the bright wind of heaven (Cecily Taylor) Excellent words of the changes brought about by a "bright wind" that blows away the chaff of our hating, and fans the flames of love. Joyful tune. Tune In / Online Resource Dare to Dream (Elaine Loukes) A great song about having a vision for the future, being lead by the light of Bethlehem’s star. Free downloadable songbook, sound samples. STB158 In the dawn of the morn (Masuko Endo) This is a beautiful Japanese perspective, and would be best sung by a soloist. Lyrics in English or Japanese. TiS 688 Come to be our hope O Jesus (Jaci Marachin) This is a really fun Latin American song from the World Council of Churches Assembly in Canberra. It's not easy the first time, but once you've heard it, it's very catchy. The words are really excellent, despite a slightly clunky translation. It would be worth teaching to your congregation! Good for kids. NCH121 / UMH210 / VU005 / WoV629 / ELW266 / W&R163 / Cha139 All earth is waiting / All earth is hopeful / Toda la tierra espera al Salvador (Alberto Taule) Fun Catalonian tune, good words, although the English translations vary between sources. Could be good for kids. Sound sample and Spanish lyrics. MV155 Unbounded spirit breath of God (Brian Wren) Good solid words of commitment to faith and work; a communal song. Simple hymnlike tune.